Jacques d'Amboise (born July 28, 1934) is an American danseur and choreographer. 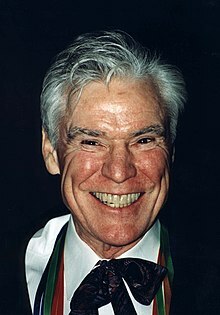 D'Amboise was born as Joseph Jacques Ahearn in Dedham, Massachusetts. He was a principal dancer with the New York City Ballet, where ballets were created especially for him by choreographer George Balanchine. D'Amboise also choreographed ballets for the New York City Ballet. As well as ballets, d'Amboise danced in films, including Seven Brides for Seven Brothers, where he played the part of Ephraim, one of the brothers—and Carousel (1956), where he danced the ballet role of the Starlight Carnival barker, in which he partnered Susan Luckey in Louise's Ballet and the Disney movie "Offbeat" (1986), built around a dance class he taught to New York City police. D'Amboise founded National Dance Institute in 1976, which has been teaching school children how to dance for the past 40 years. The NDI program often combines music and art with studies of other cultures, histories, and literature, offering a unique and comprehensive performing arts experience, while fostering curiosity and a sense of achievement. The documentary film about Jacques d'Amboise and National Dance Institute, He Makes Me Feel Like Dancin', won an Academy Award for Best Documentary Feature in 1983 and an Emmy Award in 1984 for Best Children's Programming. In 1999, for the National Dance Institute Step-by-Step program, he hiked the Appalachian Trail with his son George to fulfill his dream of back-packing the entire trail and to raise money for arts education. D'Amboise has received many honors and awards, including 1990 MacArthur Fellowship, a 1995 Kennedy Center Honors Award, a 1998 National Medal of the Arts, a New York Governor's Award and an Honorary Doctorate Degree from Boston College and several others, the last honorary doctorate was received was Montclair State University in May 2012. He has also received many other awards and honors for his contribution to the Arts and dance education, such as the 7th Annual Heinz Award in the Arts and Humanities. He earned a D.F.A. from Bates College in 1978. D'Amboise was an early Dean of the Conservatory of Dance at the State University of New York at Purchase and a full-time faculty member. D'Amboise married Carolyn George, a photographer and former ballerina, on New Year's Day 1956. They have four children including ballet dancer/choreographer Christopher d'Amboise and dancer Charlotte d'Amboise. He is the father-in-law of Charlotte's husband Terrence Mann and Christopher's wife Kelly Crandall. Carolyn George died on February 10, 2009, aged 81. ^ "Jacques on the Appalachian Trail". National Dance Institute. Archived from the original on February 19, 2013. Retrieved November 13, 2012. ^ Anstead, Alicia. "The Dancing Hiker". Archived from the original on December 4, 2008. Retrieved November 13, 2012. ^ College catalogs, State University of New York, College at Purchase, 1972-1978.